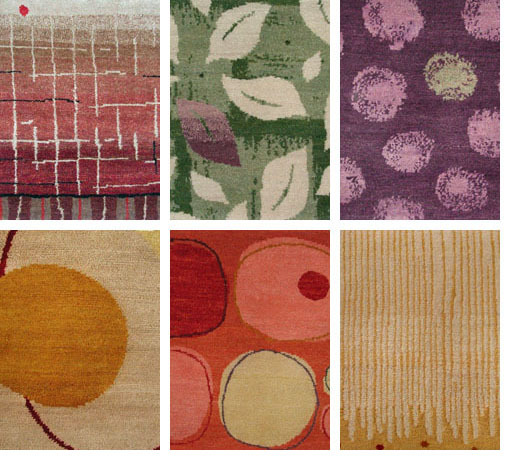 The rugs in this collection are hand-made in Nepal with the finest Tibetan wool obtained from high altitude sheep. This wool produces a very strong yet soft fiber that is rich in natural lanolins and delicious to walk on. From $88.00 per square foot. The weavers in Nepal use centuries-old techniques, first carding the raw fibers and then spinning and dyeing them. Using 3-ply wool and a traditional Tibetan knot, the weaver creates the rug, the design revealing itself, knot by knot, row by row. The result is an original and resilient carpet of extraordinary quality. All carpets are made to order of hand-carded, hand-dyed and hand-knotted 100% Tibetan highland wool. The dyes we use for this collection are vegetable dyes. Any irregularities of the natural materials, the dye lot, or variations of human touch are what create the richness of each individual carpet.